Many inventors enjoy a career that spans multiple decades yet are primarily remembered only for their most successful creation. Today, we look at some of their minor creations that were mainly forgotten by history despite their usefulness, innovation, or strangeness. Hiram Maxim was one of the 19th century’s most prolific inventors. His most significant achievement came in 1883, when he invented the Maxim gun, the first fully automatic machine gun. While other similar weapons like the hand-cranked gatling gun predated it, the Maxim gun was recoil-operated, portable, water-cooled, and could fire 600 rounds per minute just by pressing down the trigger. It saw plenty of action during World War I, and it eventually morphed into the Vickers gun, the machine gun used by the British Army for decades. 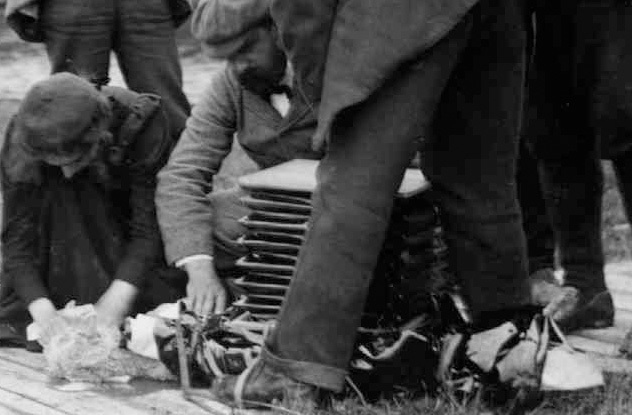 After the success of his machine gun, Maxim turned his attention to aeronautics. To fund his research and to boost public interest in flying, Maxim designed an amusement ride for the Earl’s Court Exhibition of 1904. It was a swing ride that used rocket-shaped cars instead of chairs and proved a massive hit. The ride was called “Sir Hiram Maxim Captive Flying Machines.” His original plan was to add rudders and airfoils to allow riders to control their cars, but he wasn’t allowed due to safety regulations. This angered Maxim, who eventually dismissed his invention as a “glorified merry-go-round.” However, this didn’t detract from its popularity, and new “Sir Hiram Maxim Captive Flying Machines” were built at several resorts and fairgrounds throughout England. 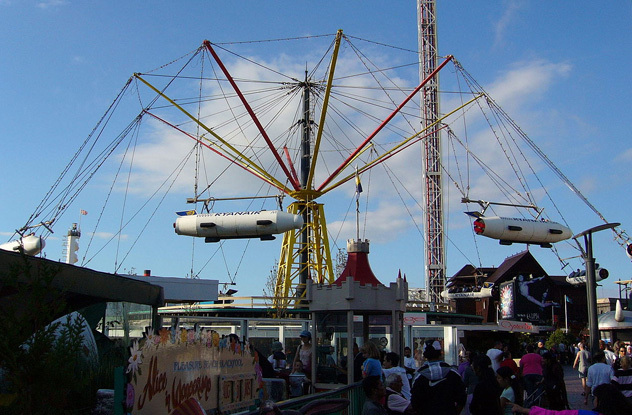 The ride at Blackpool Pleasure Beach, pictured above, is still working, making it the oldest operational ride in Europe. Many sci-fi fans consider Hugo Gernsback the “father of science fiction.” Indeed, the Hugo Awards for best science fiction or fantasy are named in his honor. Gernsback had a very prolific career as a magazine publisher and editor. Among many others, he launched Amazing Stories in 1926, the first sci-fi magazine in history. During his lifetime, Gernsback’s reputation wasn’t so pristine. He tried his hand at writing, but his stories weren’t well received. He was infamous in the publishing biz for trying numerous times to stiff his writers on payment, earning the moniker “Hugo the Rat” from H.P. Lovecraft. He also fancied himself an inventor and held dozens of patents throughout his life. While Gernsback clearly had a strong vision of the future (he predicted wireless technology, television, and air conditioning), his own inventions were a bit lackluster. A perfect example of this is “The Isolator,” a helmet that would allow its wearer to work in complete tranquility regardless of their circumstances. It was advertised as being completely soundproof and airtight, so it needed its own oxygen supply. Gernsback first showcased his invention in the 1925 issue of Science and Invention, a magazine primarily focused on recent scientific developments. 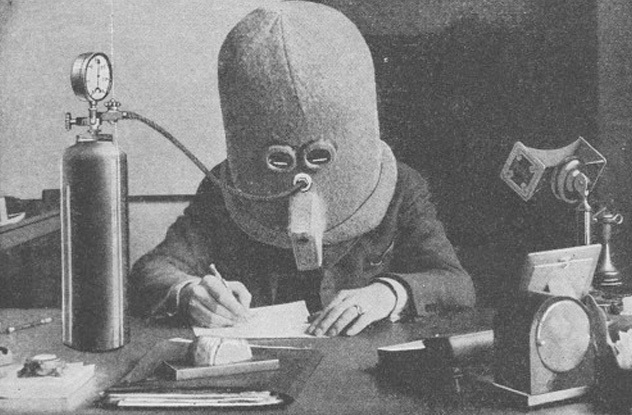 For the photograph, Gernsback himself donned The Isolator to show it in action, but oddly enough, the helmet was never put into production. John Logie Baird is remembered prominently for his work on the television. Although many people had contributions that led to the TV as we know it today, Baird is usually considered the inventor of television for building and demonstrating the first working mechanical television system in 1926. Most of his later career was spent working on improvements for the television. However, his earlier work was much more varied. Baird made several inventions, including a glass razor and pneumatic shoes for people with flat feet. These never really went anywhere, but Baird eventually found success with a new type of sock. In 1915, Baird tried to enlist for World War I but was declared unfit for duty, so he instead worked for a munitions factory. During that time, he became aware of trench foot, a common problem for soldiers who had to wear wet socks for long periods of time. If left untreated, this resulted in infection and could even lead to amputation. That’s how the Baird Undersock was born. It was simply another pair of socks (or “gents’ half-hose,” as it was called back then) that was worn under the regular pair to soak up moisture. It was also coated with borax, which acted as an antiseptic. 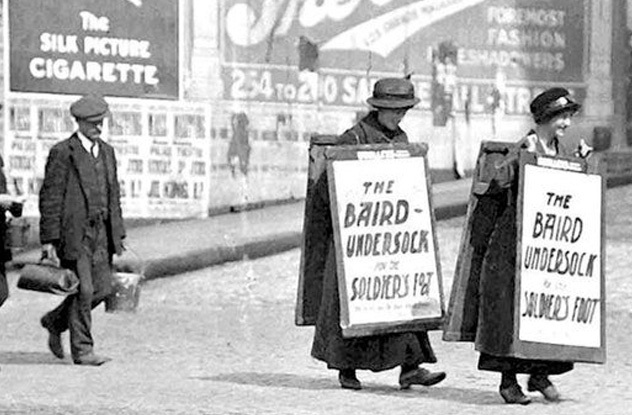 The Baird Undersock was very successful and allowed Baird to quit his job and start selling it full-time. It also benefited from a creative marketing campaign that included soldier testimonials and women walking the cities with sandwich boards promoting the undersock. Almost 150 years after his death, Eugene Rimmel is still one of the biggest names in cosmetics. He was a pioneer of the industry who developed many new products, particularly the nontoxic mascara that is still known simply as “rimmel” in many countries. His cosmetics brand founded in 1834 is still going strong and is present in dozens of nations all over the world. Besides making people smell nice, Rimmel also strived to improve human hygiene. Obviously, people taking more baths meant they would use more of his products, so, in essence, it was still a marketing ploy but one with a positive outcome all-around. 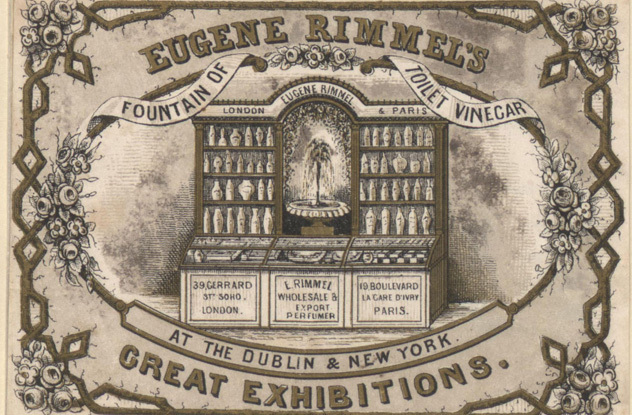 One of Rimmel’s first success stories was known as toilet vinegar. It was a mixture of oils with white vinegar, lavender extract, and tincture of benzoin infused for 10 days and then filtered. Originally, it was intended to be used as a moisturizer or a shampoo. However, people soon realized that the concoction was also very effective at removing stubborn stains from the toilet. Although Rimmel never originally intended his new mixture to be used as a lavatory cleaner, he had no problem rebranding his product. His toilet vinegar was soon being sold as a “tonic and refreshing adjunct to the toilet or bath,” boasting disinfectant and sanitary properties outmatching those of any other Eau du Cologne. Back in 1482, Leonardo da Vinci was commissioned by the Duke of Milan, Francesco Sforza, to build an equestrian statue. Leonardo’s idea became known as the Gran Cavallo—a 7.3-meter (24 ft), 80-ton bronze giant that would have been the largest equestrian statue in the world. 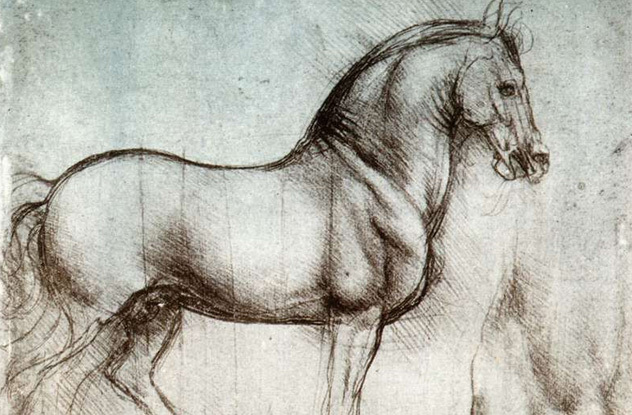 Impressed with his plan, the Duke set aside bronze for Leonardo’s horse. However, as with many of da Vinci’s ambitious undertakings, this one required a lot of work and preparation. Equestrian statues were nothing new, but Leonardo wanted to cast the entire 80-ton horse out of one solid piece of bronze. Something like that had never been done before and, at the time, was considered impossible. Therefore, Leonardo had to devise an entirely new casting method, which he described in his notes. Unfortunately, the master never got to see his vision come to life. By 1492, Leonardo had completed the clay model of the statue, which was dominating the landscape inside the duke’s castle. However, in the meantime, Milan had gone to war with France, and the duke had to repossess the bronze promised to Leonardo to make cannons. Over the next seven years, Leonardo’s project was put on hold until France conquered Milan in 1499. French soldiers storming the castle promptly destroyed Leonardo’s clay model, putting an end to the Gran Cavallo. It wasn’t until a few decades ago that the horse statue was finally erected thanks to an American named Charles Dent. John Napier was a prominent Scottish polymath known primarily for his contributions to mathematics. He invented logarithms and popularized the use of the decimal point, but he also studied astronomy and physics—and, as we’ve seen before, he liked to dabble in the occult. He also invented a calculation aid called Napier’s Bones, which served as a precursor and inspiration for the first mechanical calculators. It consisted of a set of numbered rods mounted on a plate. The standard bones were set up to solve multiplication and division through simple additions and subtractions, but Napier also described how to set up his device for solving square and cube roots. The system was based on a lattice multiplication method that was first used by Arab and Indian mathematicians. 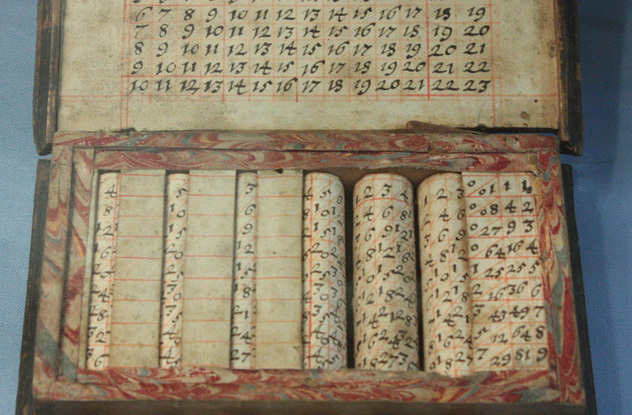 Just decades after the appearance of Napier’s Bones, the first true mechanical calculator was built, either by Blaise Pascal or Wilhelm Schickard depending on whom you believe. Even so, Napier’s Bones remained a practical tool still used hundreds of years later with only minor changes to improve the design. It also spawned several derivatives like the Genaille-Lucas ruler from 1891. However, its most significant descendant was, without a doubt, the slide rule. Built in 1621 by William Oughtred, it was based on the Napier’s Bones design and was still used centuries later by NASA during the Apollo Program. There’s an apocryphal story that Christopher Columbus once issued a challenge to his critics to stand an egg on its tip. After they all failed to do so, he succeeded by tapping the egg against the table beforehand and flattening the tip. Columbus wanted to show them that something they all proclaimed to be impossible was actually very simple. Nowadays the story is brought out to illustrate creativity and thinking outside the box, but 100 years ago, Nikola Tesla took it a bit more literally. It was 1893, the year of the Chicago World’s Fair, also named the World Columbian Exposition to mark the 400th anniversary of Columbus’s famous voyage. The “War of Currents” was underway, and Tesla wanted to use the World’s Fair to show off his alternating current induction motor. 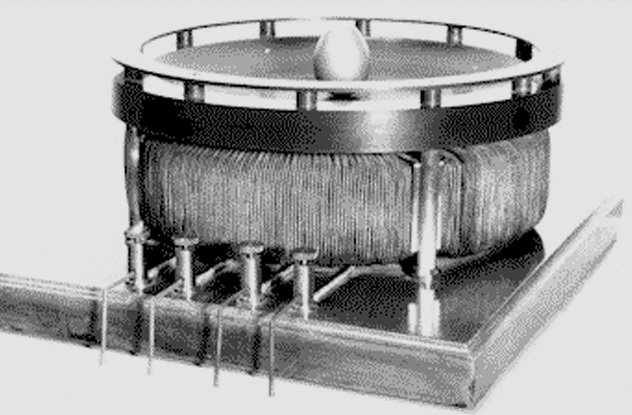 To do so, Tesla built his own Egg of Columbus device, which was capable of standing a copper egg on its tip. The device was an iron core stator with several coils wound around it. 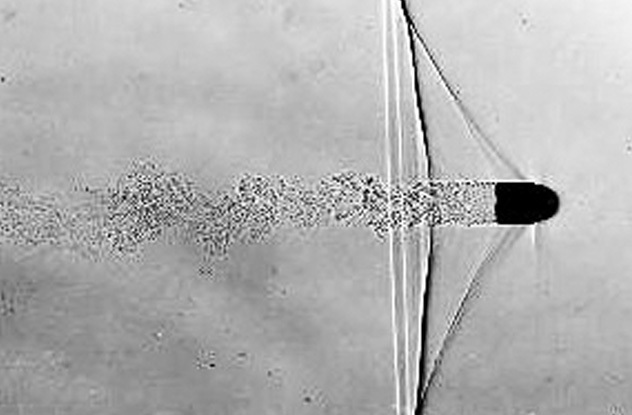 When powered, it generated a rotating magnetic field that not only stood the metallic egg on its tip but also spun it on its major axis thanks to its gyroscopic action. Besides being an apt exhibit for the Columbus World’s Fair, Tesla’s egg did a great job of illustrating the principles behind the rotating magnetic field, a core element of the alternating current motor. Although the original device was lost, several replicas were built and are found today in museums. Known as “Papa Flash,” Harold Edgerton invented the electronic flash and revolutionized photography. Using a stroboscope, he was able to capture never-before-seen images, including his most famous shot, reproduced above, of a bullet piercing a playing card. Although Edgerton developed this technology in the 1930s, it took a while before it caught on. Therefore, Edgerton started looking for new areas where his technology might be implemented, and he contributed toward the development of sonar and deep-sea photography. In 1972, Edgerton received a telegram from his friend and fellow inventor Robert Rines. Rines was asking for Edgerton’s help in finding the Loch Ness Monster as he believed Edgerton could invent new equipment capable of penetrating the loch’s brownish, murky waters. Some suspicious photographs Rines took by himself persuaded Edgerton to help. While not necessarily a Nessie believer, Edgerton relished the opportunity to overcome the technical challenges of photographing an animal under those conditions. Over the next years, he worked on new equipment that would rise to the challenge. As late as 1987, Edgerton wrote to Rines talking about building a new “streak camera” capable of detecting moving objects. They never found Nessie, but it wasn’t time wasted. For starters, much of the new technology invented by Edgerton made its way to normal cameras. The group did uncover a World War II Wellington bomber and found mysterious stone circles at the bottom of the lake, later to be determined to be normal rocks fallen off construction boats. As one of the world’s most prolific inventors, Thomas Edison had over 1,000 patents. While not one of his best known inventions, the electric pen was one of Edison’s first success stories. At this time, Edison was a 28-year-old, little-known inventor who was researching ways of improving the telegraph. Edison noticed that the stylus of the printing telegraph left a mark beneath the paper as it punctured it. Together with his colleague and fellow inventor Charles Batchelor, he devised a duplicating machine that used perforated paper as a stencil and made copies from it. 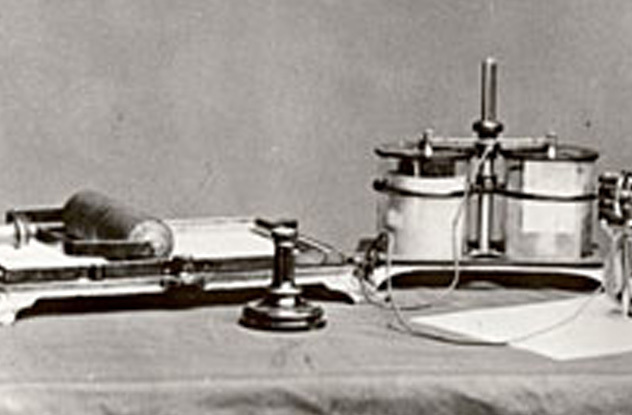 The electric pen was the main component of a set that also included a wet-cell battery, an ink roller, and a holder, stand, and duplicating press all made from cast iron. The whole thing more resembled a sewing machine, as the pen didn’t actually write but rather punched thousands of tiny holes in perforated paper to create a stencil. Then the paper would be placed in the duplicator, and the ink roller was used to make as many copies as desired. The machine boasted that it could perform 15 copies per minute and 15,000 total copies from a single stencil. Edison’s electric pen became the first commercial appliance with an electric motor. It was also the first invention he put into mass production. It was successful and sold all over the world but became rather outdated once the typewriter was invented. Despite his close association with the telephone, Alexander Graham Bell maintained a lifelong interest in many other fields such as aviation and medicine. This led to several notable inventions, such as an early metal detector built to save President James Garfield and an artificial respirator that was a forerunner to the iron lung. Around the same time that Bell was trying to save the president’s life, his wife was pregnant with their third child. Although Edward Bell was born on August 15, 1881, he died after a few hours due to breathing problems. Wanting to prevent this from happening in the future, Bell built a primitive artificial respirator he called a vacuum jacket. The jacket consisted of an iron cylinder wrapped tight around the patient’s chest. The helper could change the air pressure inside the cylinder with a hand pump, thus compressing and releasing the patient’s chest and transporting air in and out of the lungs. In 1882, Bell built a smaller version of the vacuum jacket that could be used on animals and proceeded to revive a lamb with it. Over the next decades, Bell perfected his invention. It was never used on a large scale. However, the vacuum jacket did illustrate the basic principles used later on in the iron lung.